What’s the deal with tricking kids into eating stuff and then telling them about it later? No, stop a minute, I’m serious here. I didn’t eat yogurt for decades — DECADES — because some mother gave it to me when I was five and told me it was ice cream. And no, it wasn’t frozen yogurt from the freezer, it was yogurt from the fridge. If you’ve read Suffering Succotash, then you are now acquainted with my friend Lora, the vegetarian who only will eat meat if it’s ugly and scary (or bacon). Lora was also told a food lie only to be told the food truth after she had eaten it. Now, if you really are going to lie to someone about what they’re eating (which: don’t), then don’t also do a pee-pee dance over the truth WHILE THEY’RE EATING IT. I mean, why — why would you do that? It totally undermines the point of the lie in the first place, and it’s kind of assholish. You want more incentive than my yogurt or Lora’s pet bunny trauma not to do that? Okay: guy who hates lamb eats lamb at my grandmother’s house, but is told it’s beef or something. On the drive home, guy tells wife he really liked that “beef.” Wife tells guy it was lamb. Guy throws up all over the car. Good enough? But seriously, how about we just don’t lie to kids about what they’re eating ever? Why? Because kids aren’t stupid, so the lie works for a very short period of time in their lives and if you push it past that time, you’re really just teaching them not to trust adults or food. I’m frequently asked how I feel about the Deceptively Delicious approach to hiding foods within foods, which I feel is not so much an outright lie as it is trickery. I think I can say that I won’t ever try to hide spinach in brownies or ice cream because, A) I’m retching just thinking of that, so I don’t know how I’d get through the cooking process; B) that’s not going to help kids in the long run. See, for kids to truly accept foods, they have to know what they’re eating and get used to the flavors/textures. If you shroud those things in cream or chocolate, kids will never become accustomed to them and never like them without the artificial trappings. It’s like when your boyfriend finally sees you without your make-up on and doesn’t run screaming down the hall or try to stake you with a chair leg, that’s when you know he truly loves you for you. If there’s something a picky eater dislikes and it gets hidden in food there’s a very good chance the picky eater will taste it because he or she is so highly attuned to that particular flavor. That’s not fussiness, that’s their brain protecting them. Once and only once, my mom tried to hide green peppers in her meatloaf, but I could totally taste them and their flavor polluted what was an otherwise perfect (as usual) meatloaf. If I’m really honest with myself, I know that I do some amount of food hiding, but it’s not an intentional deception. It’s the recipe. (And by “recipe,” I mean the “regular recipe” as opposed to the “doctored recipe” found in Seinfeld’s cookbook.) For instance, vegetables get pureed into tomatoes to make a base for a marinara sauce. Sometimes those vegetables are carrots and celery and onions, other times I might replace carrots with squash. Another thing I’ll do is switch basil out for arugula, chard, or parsley. I still call it pesto, it’s just not basil pesto. Now, again for honesty: do I beat my three-year-old son over the head with the difference between basil versus arugula pesto? No, because at this age, he doesn’t care either way what the ingredients are. If he likes the way a food looks, it’ll go in his mouth. If it looks strange, it won’t. Getting it into his mouth is 85% of the battle because once he’s decided it’s okay to eat, his brain will keep reassuring him that it’s a safe food unless something weird — unexpected dislike of flavor or texture — sets him off and then he’ll spit it out. The other night, I gently braised the plucked and trimmed baby artichokes in a soothing soak of white wine, lemon juice, and olive oil. Halfway through, I added pinches of thyme that had been rubbed between my index finger and thumb to coax woodsy, pungent oils. Once the baby artichokes were tender enough to pierce with a knife, I glossed them with butter-sauteed torpedo onions and served them up. 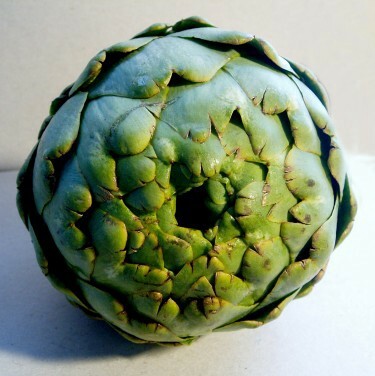 On past occasions, Bug won’t even touch the artichokes but this time he reached for one and stuffed it in his mouth. To my delight, he even chewed a bit. I got excited. Then he made a face and opened his mouth in distress. We don’t normally encourage spitting food out at the table, but I cupped my hand over his mouth and let him do just that. Baby artichokes are bitter and while I love them for that, I get why Bug doesn’t. We’ll try again another day. Stephanie V.W. Lucianovic somehow survived 27 years of picky eating without coming down with rickets or scurvy, which clearly gave her license to become a food writer in San Francisco, where she wrote a humorous, non-fiction exposé on the inner lives of picky eaters. Her first book is called Suffering Succotash: A Picky Eater’s Quest to Understand Why We Hate the Foods We Hate.